According to Broward Sheriff’s Office, a bicyclist was killed today after he was hit by a cement truck near Davie Boulevard. The authorities have not revealed the circumstances of this latest fatal bicyclist accident, but one can reasonably suspect that the truck driver did not see the bicyclist, or did not see the bicyclist with enough time to avoid fatally striking the victim. Last year, Leesfield Scolaro began its “Share the Road” campaign, by promoting the same message on its U.S.1 signage as illustrated below. This campaign was born out of the necessary collective realization that Florida is the most lethal state in the nation for bicyclists. South Florida alone has reported over 2500 bicyclist accidents in 2014. A trend that is continually increasing by all measures. Florida leads the nation in fatalities with 119 in 2014, which rounds up the number of bicyclists killed on the road to over 550 between 2010 and 2014. This epidemic has not been curbed by community leaders, politics, policies, or fines and criminal penalties. If a change does come in the future, it will have to be triggered by a collective behavior modification of drivers throughout the entire state of Florida. The tragedy that occurred today is even more personal to Leesfield Scolaro because it is eerily similar to a recent case where friends of members of our lawfirm were involved in a bicycle accident with a truck. In that case, the incident was caused by a distracted truck driver who decided to take his eyes off the road to adjust his GPS and failed to avoid two bicyclists whom he struck with incredible force and violence that it permanently changed two innocent lives. Tagged: "bicycle accident", "cement truck", "cylist accident", "Distracted Driver", "distracted driving laws", "fatal accident" and "wrongful death"
According to reports, a worker was killed while working on a Miami high-rise condominium building construction site yesterday. The details of the incident are unknown, but the Miami Herald reported today that, the 29 year-old construction worker was hit by a piece of heavy machinery being hoisted by a crane. According to Miami Fire Rescue Capt. Ignatius Carroll., the employee was working on the 37th floor of the condominium at the time, and the heavy piece of machinery that fell on him weighed more than 2,000 pounds. For the past 15 years, the downtown area of Miami has seen an explosion of condominiums and office buildings, and endless construction sites. Sadly, every year construction workers are gravely injured, some fatally, due to the failure of heavy equipment or a varying degree of negligence of co-workers. The latest incident reported by the Miami Herald today is very similar to a complex case Leesfield Scolaro resolved recently. In that case, a crane operator lowered the crane down for the night. To do so, he had to follow a certain procedure in order to properly and safely lower the crane: First the operator had to lower the luffing boom, make sure it was not extended, and then lower the main boom. Unfortunately for our client, the crane operator lowered the main boom first, while the luffing boom was still extended. A split second later, the crane began to tip forward. The workers present on the site ran for cover, but our client was unlucky. While running away, the crane boom struck him on his hard hat, knocking him to the ground. Then the boom bounced off the end of a beam, ricocheted to the ground demolishing and crushing his right leg. A lawsuit was filed immediately and after a successful litigation process, the injured construction worker was able to settle his lawsuit with all of the at-fault parties. Tagged: "construction accident", "Construction worker", "downtown miami", "edgewater condo" and "wrongful death"
On sunday evening, Ernesto Hernandez, 23, was pronounced dead at Ryder Trauma Center in Miami where he was airlifted following an incident off Nixon beach in Key Biscayne, Florida. Ernesto was with his family and friends on a sunday afternoon when a nearby motorboat became stuck on a sand bar. Several people jumped out of the boat, including Ernesto, to assist the operator of the boat to free up the vessel from the sand bar. That is when one of the four propeller engines of the boat caught Ernesto and inflicted fatal injuries to his body. Jorge Pino, an investigator for the Florida Fish and Wildlife Conservation Commission relayed to the media that the “young man who came to assist ended up in the rear of the vessel and one of the engines and the propeller actually caught his body, his torso.” Despite the rescue efforts, first of his friends and family, followed by fire rescue, Ernesto succumbed from the injuries he sustained while helping the vessel. The boat in question is a 40-foot pleasure boat operated at the time by DJ Laz, a popular South Florida radio voice. The vessel was being used as Pitbull’s vodka brand Voli Spirits’ promotional boat. 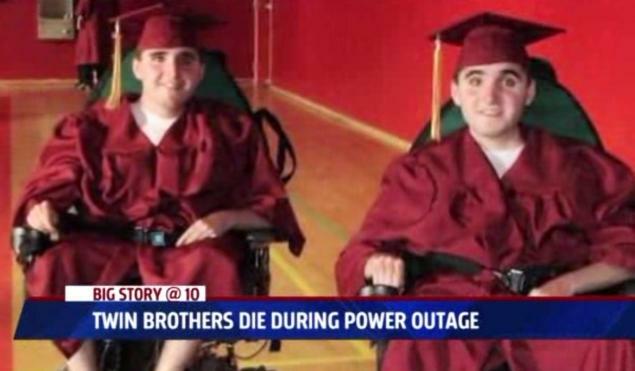 In Northern California’s Calaveras County last night, twin brothers Ryan Hall and Joshua Hall died during a local power outage. The two 22-year-old brothers were ventilator dependents and the early investigation revealed that their respective ventilators’ back-up system systems failed when the house lost power. Ryan and Joshua Hall suffered from muscular dystrophy and relied on their ventilator to breathe for them. Sheriff Gary Kuntz told reporters that the investigation is focused on the reasons why the backup systems failed. This tragic incident is eerily similar to a case Leesfield Scolaro recently handled and successfully resolved after almost three years of litigation, and a $2.5 million wrongful death settlement was reached for the parents and sole caretakers of the 31 year-old man who died.